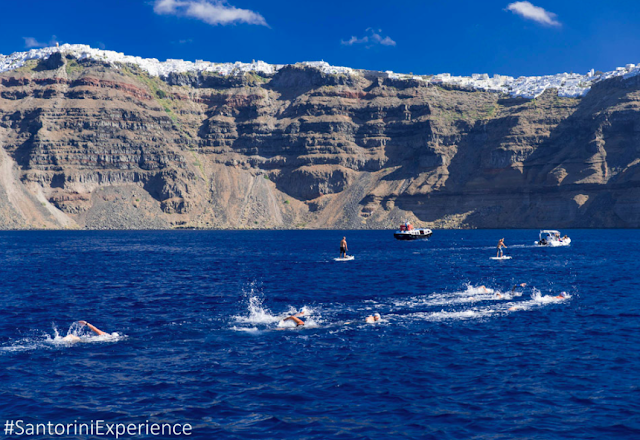 The 1.5-mile open water swimming race on Santorini Island in Greece will be held on October 8th. Registrations can be completed here. 2016 Rio Olympic marathon swimmer Kelly Araouzou will headline the female open water swimmers while several men from the Greek National Swim Team will also compete such as Antonis Fokaidis, Giorgos Arniakos and Dimitris Negris as well as International Marathon Swimming Hall of Fame inductee Mányoki Attila who once swam 79.6 km along Lake Balaton between Balatonkenese and Keszthely in 25 hours 32 minutes. The Santorini Experience will take place on Sunday under the auspices of the Greek National Tourism Organization and the Hellenic Swimming Federation. A detailed event schedule is here.